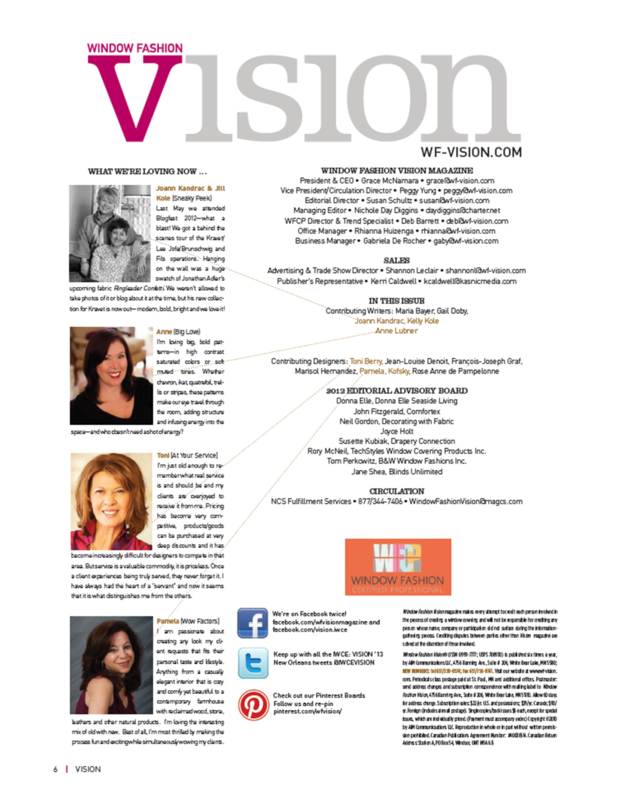 Did you see us in the Summer 2011 Issue of Philadelphia Style Magazine? 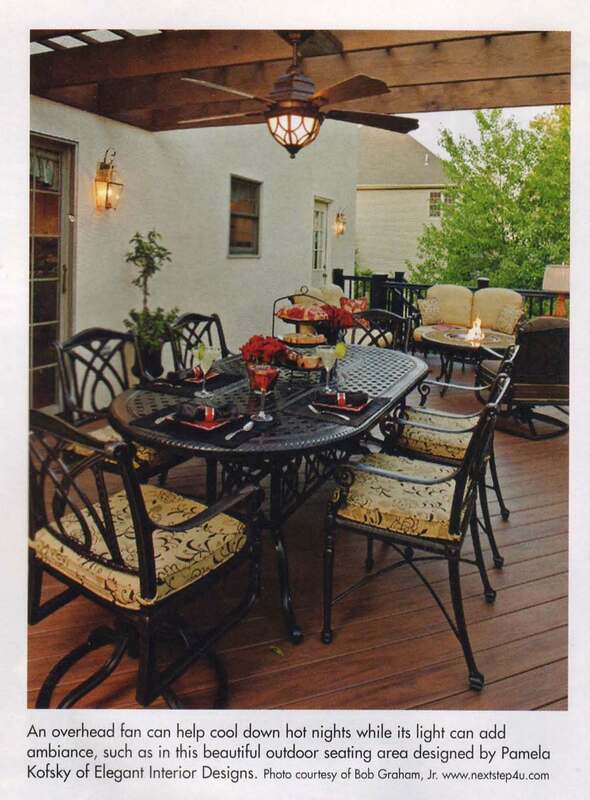 Our award winning backyard escape was featured in the Table of Contents and on page 112. 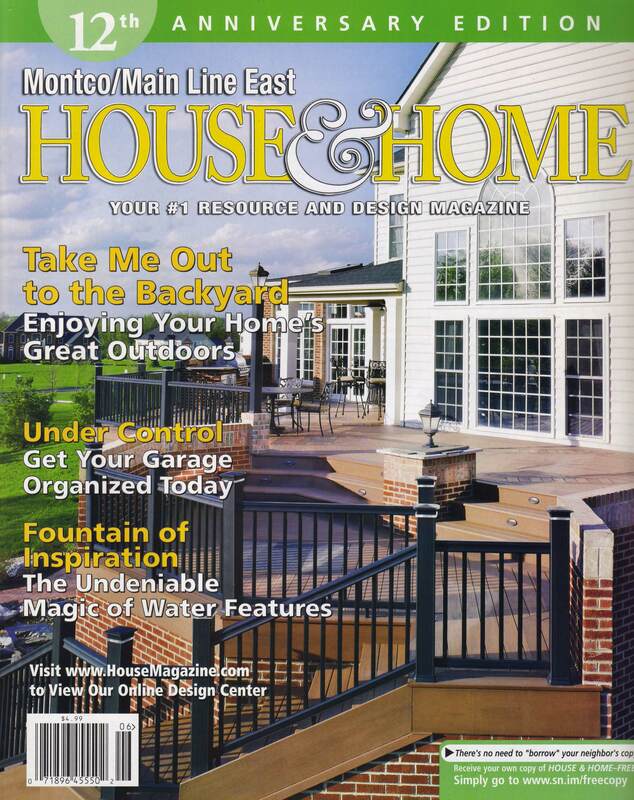 Pamela Kofsky, founder of Elegant Interior Designs, was one of four designers featured in the article for decorating advice in House & Home Magazine. 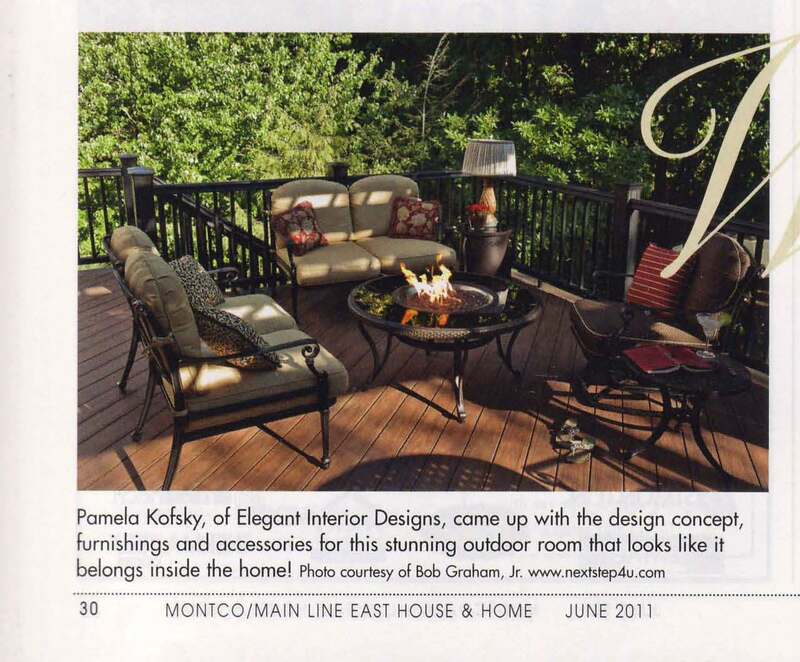 Not only was Pamela quoted throughout the article but images of her designs were as well. 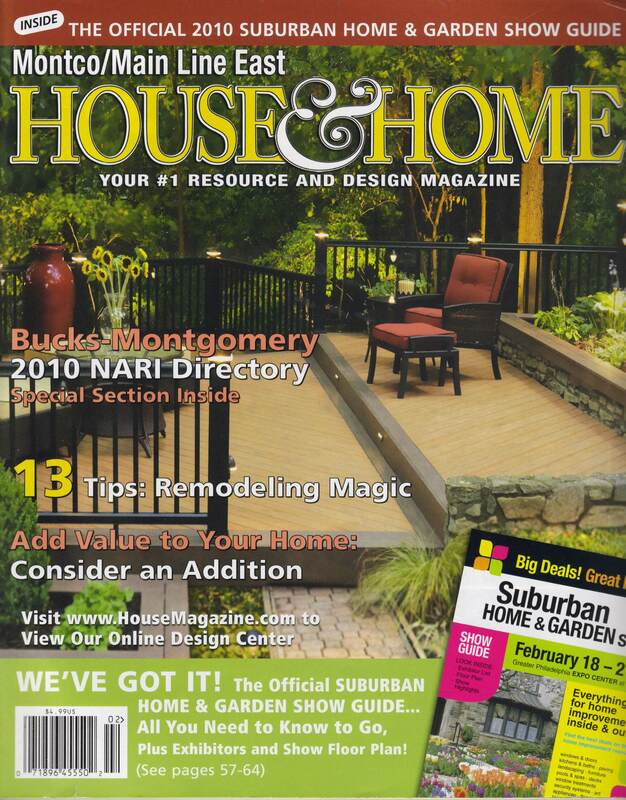 This article ran in both the Montco/Main Line East and DelChester/Main Line West edition. 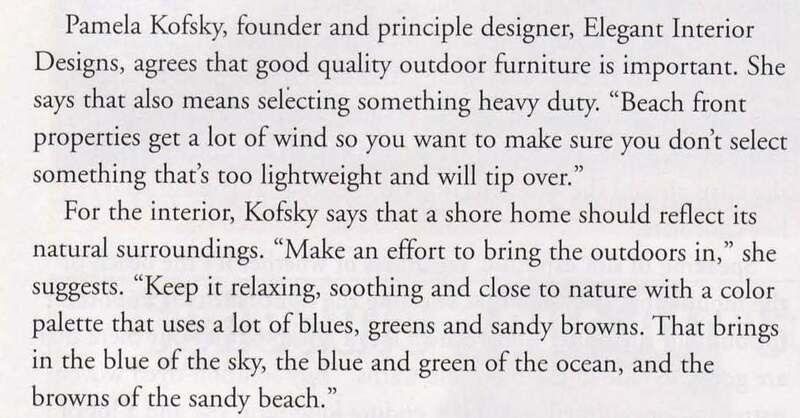 Kofsky provided her decorating advice on ways to make your ‘home away from home’ shine this summer. 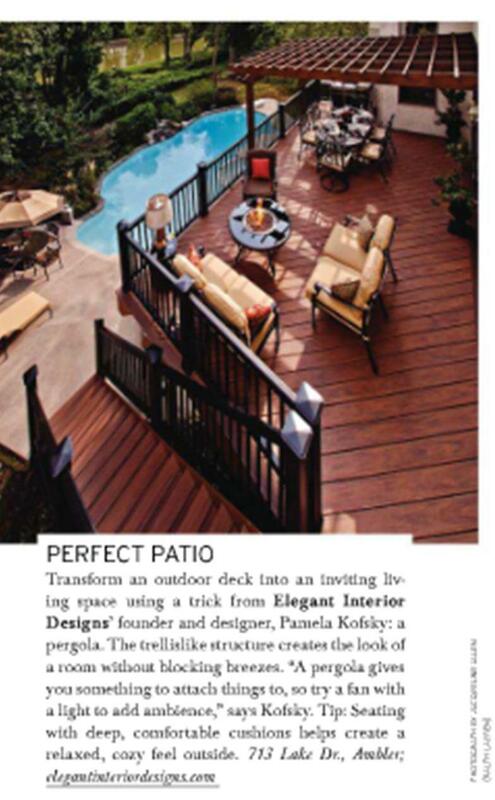 For more ideas or a consultation to make your space a true escape contact Elegant Interior Designs. Privacy can be as simple as the push of a button. 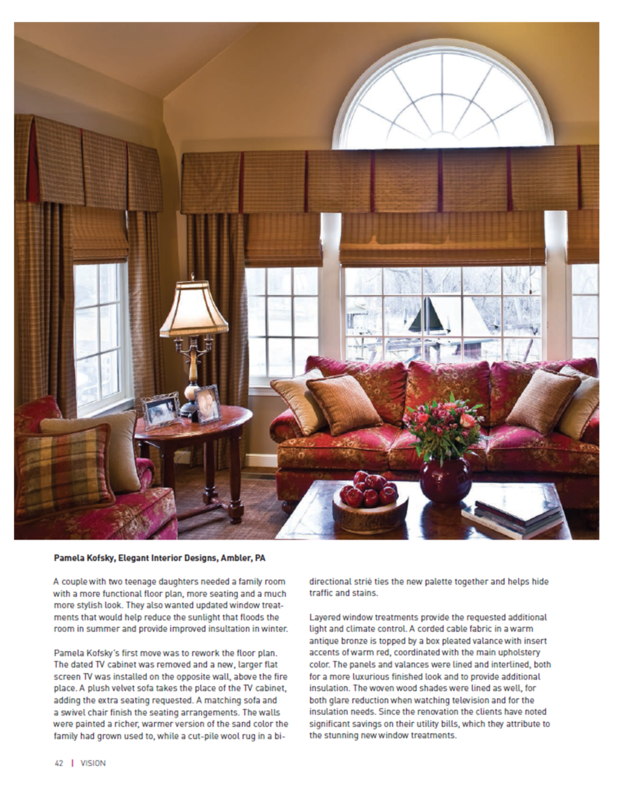 Pamela Kofsky, founder of Elegant Interior Designs, featured a 2 page article on the benefits of blinds and shades for decorating. 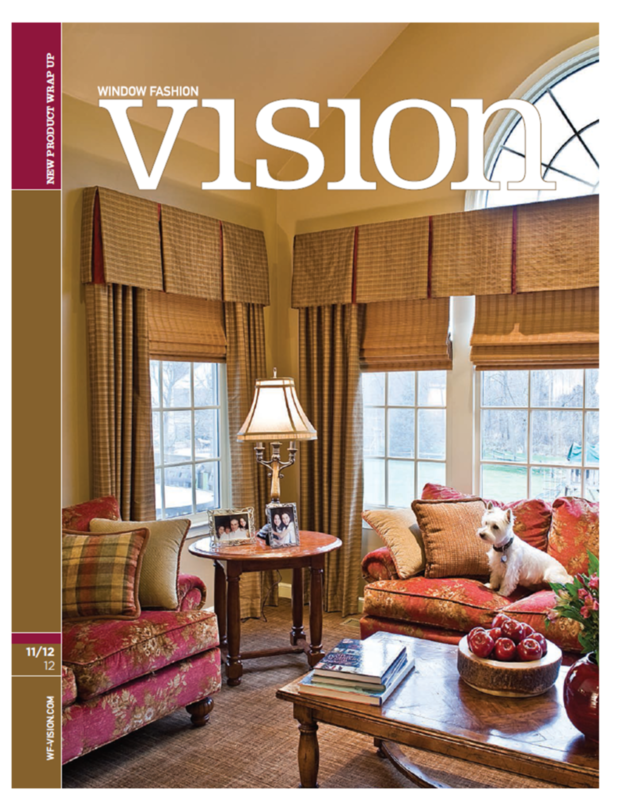 Not only did Pamela provide great practical advice, but also discussed the convenience of the many options of push button remotes for shades and blinds. 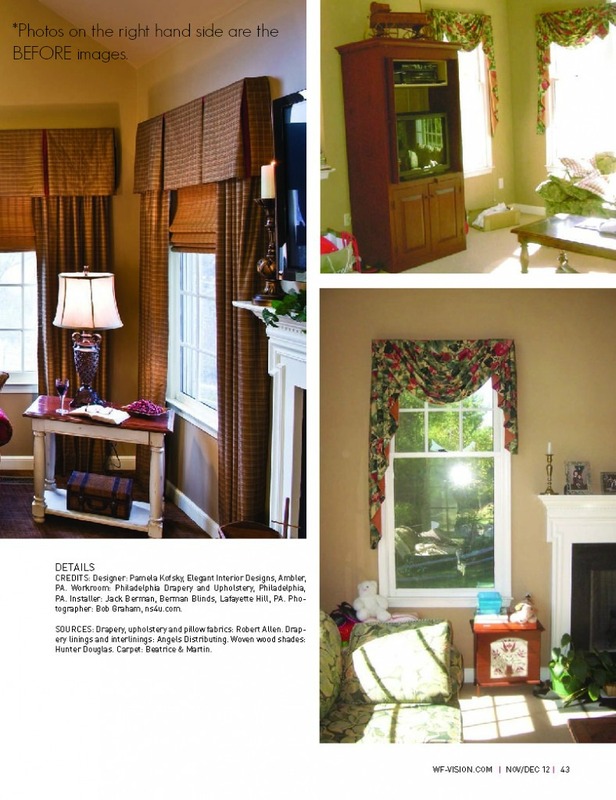 Don’t forget to add the final touches with custom window treatments. 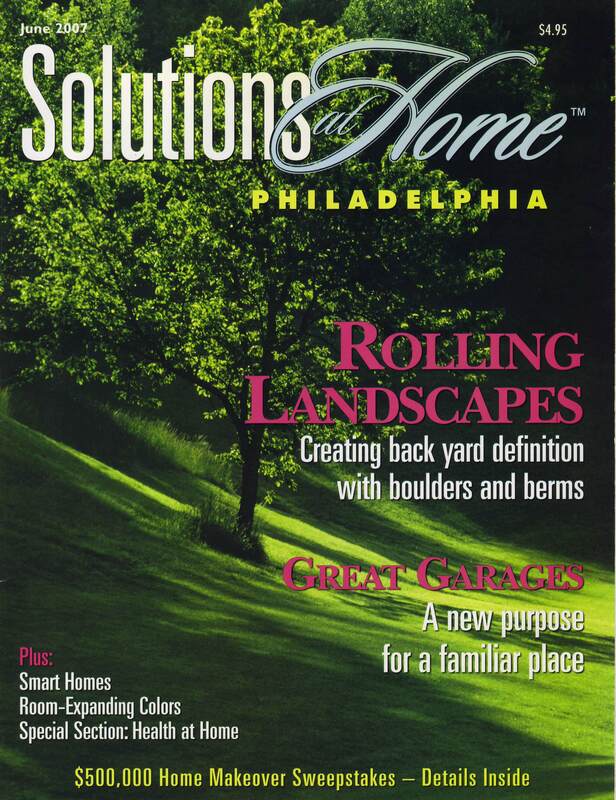 Pamela Kofsky of Elengant Interior Designs was asked her professional opinion in Solutions at Home Philadelphia June 2007 edition. 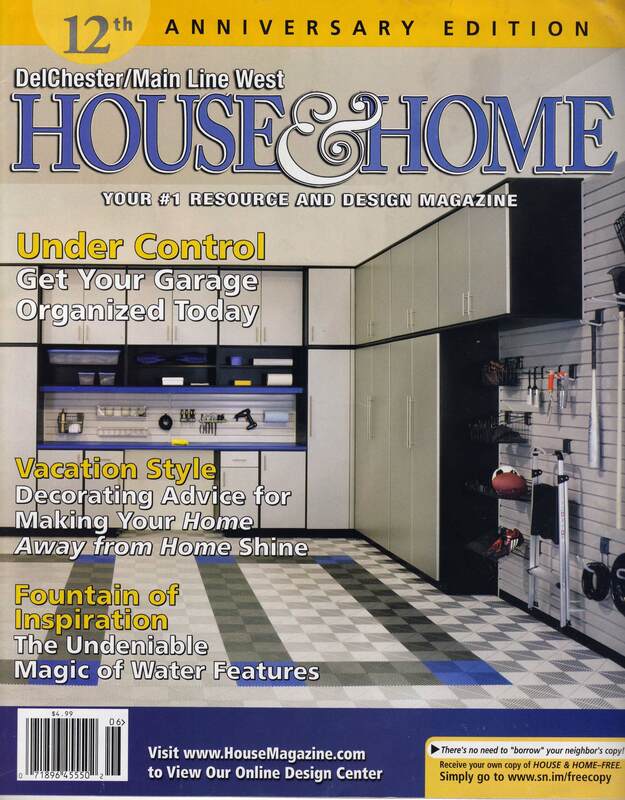 “What color can instantly open up a room?” Are you thinking of a color change in your space? 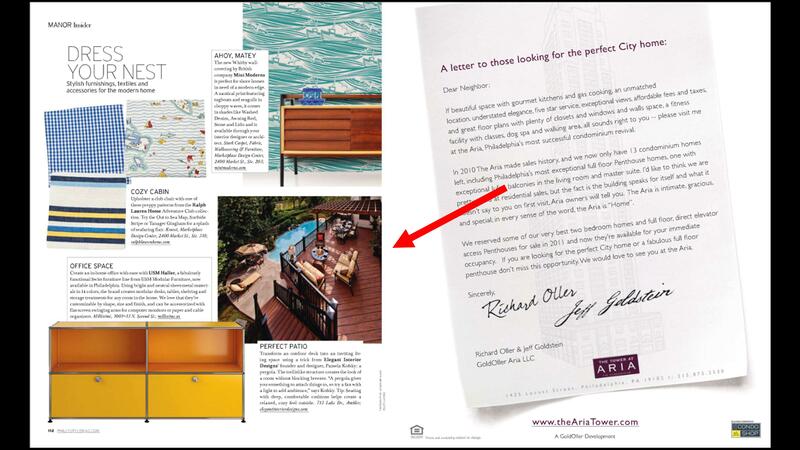 See Pamela’s article below or contact her directly for a one on one consultation to not only select the right color and shade but to also create the right feel for your space.